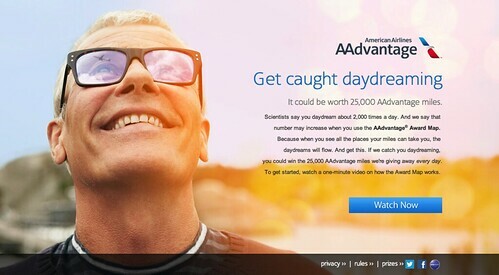 Instant Win Sweepstakes: Enter daily for a chance to win 25,000 AAdvantage Miles! What your daydreaming could win you. Every day we’re giving away 25,000 American Airlines AAdvantage miles to one lucky winner that can be used towards flights to many available destinations. For each entrant’s first Eligible Entry (hereinafter defined) into the Sweepstakes, entrant will receive a 2,500 AAdvantage miles redemption (the “Miles Earn Back”) provided that the entrant books award travel using AAdvantage miles only with the Map during the time period of June 26 through July 24, 2013 and the corresponding travel is taken by entrant between September 4, 2013 and November 20, 2013. The sweepstakes runs through July 24, 2013 and you can enter once, each day. Go here for complete details. Good luck! I didn’t win the “daily prize” but I did earn 2500 miles back on my next award redemption! Excellent! quick question… i made 2 reward bookings last week, one of them for travel in october. can i cancel (i’ve never cancelled reward bookings before. fwiw, i’m AA plat), get my miles AND money back and rebook to get the 2,500 rebate? I also have one of the Citi AA cards and will be getting 10% of my miles back anyway so any sense of whether this can be a double dip..? Thanks! @BostonSun: not worth to cancel. As an AA Plat, cancellation would incur a $150 redeposit fee. Not worth 2,500 miles for $150. @ NewNomads – Nice! Hope you go someplace fun! @ TFD – Thanks for helping out a reader! @ BostonSun – TFD gave you some good advice, it’s not worth the redeposit fee to save the 2,500 miles ($150 for the first ticket, $25 for the second). Good news though, the 2,500 rebate is in addition to your annual 10% mileage rebate as a Citi AAdvantage cardholder!